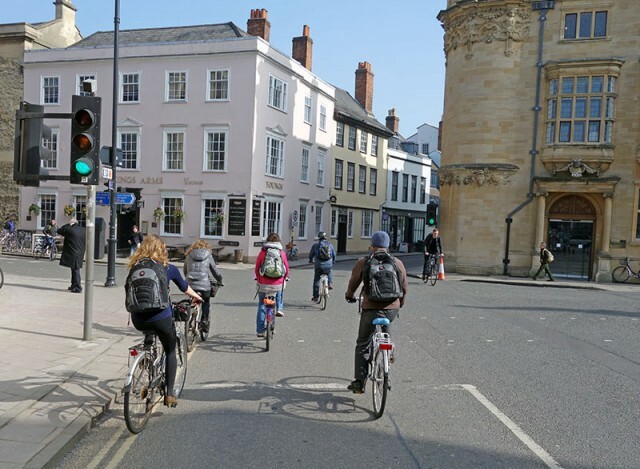 So inspired by York’s cycling campaign here are 10 good reasons to commute by bike. A good bike may cost £200-£400. But, it can last for years. You will save petrol, car parking / bus fares. It can easily add up. 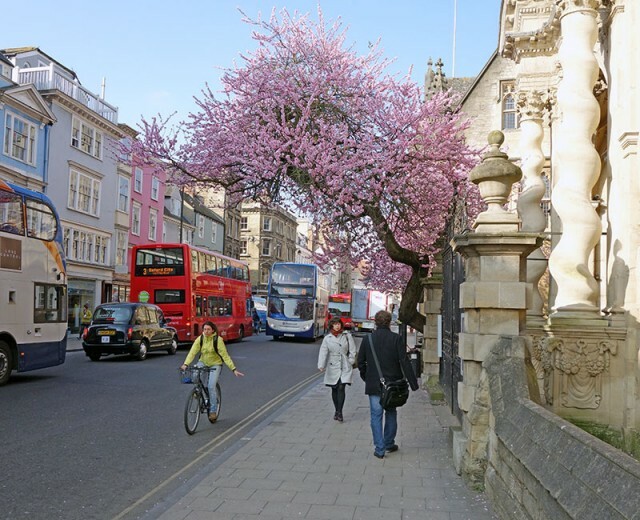 In Oxford it would cost £9 to park all day – if you can find somewhere to park. Bike maintenance is likely to be nothing more than a few inner tubes, and new chain and cassette every 3,000 miles. When you take your bike for a service, generally you don’t have to worry about spending hundreds of pounds like for a car. 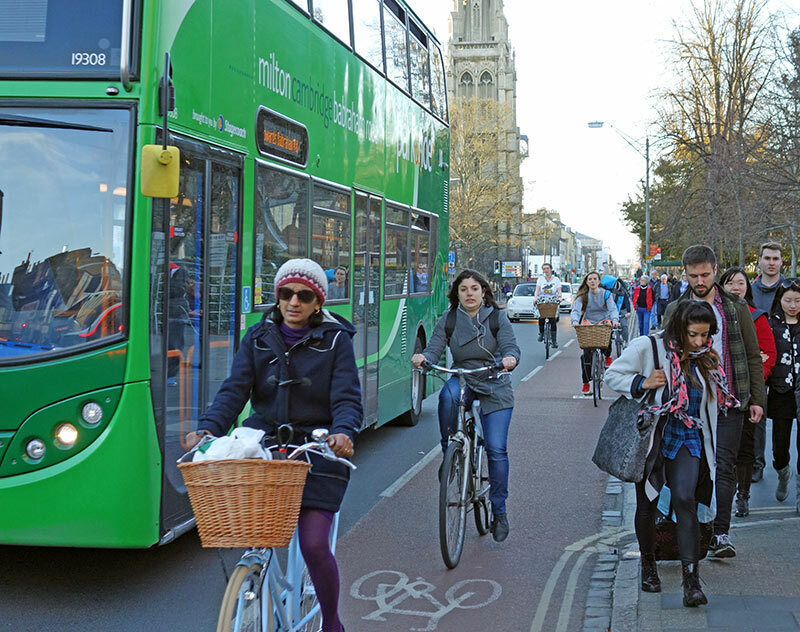 For many short distance commutes through town, cycling can be quicker than driving or getting the bus. Many of our car journeys are less than 3 miles. If you try cycling, the time is often much quicker, especially in city centres. 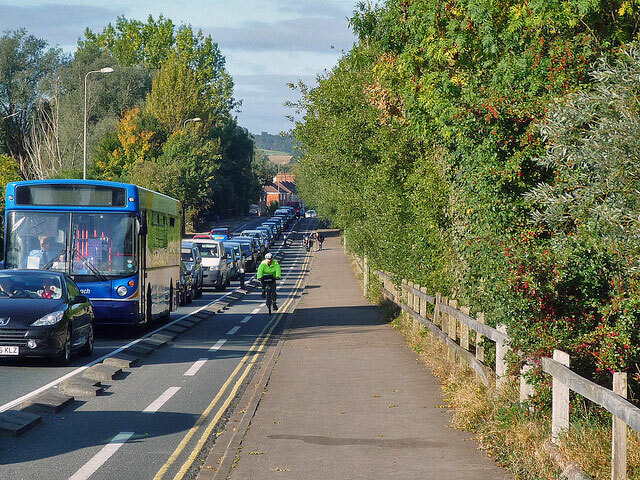 In commuting periods, you often get traffic jams and cyclists can both help reduce congestion and get there quicker. 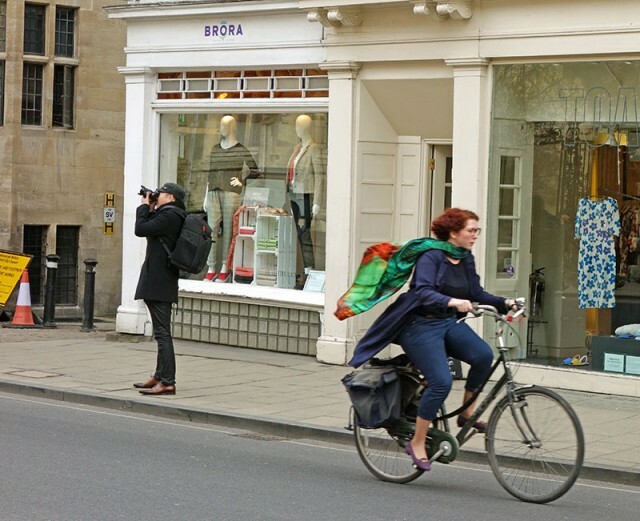 For me, getting to centre of Oxford, cycling is 5 minutes quicker than driving and 15 minutes quicker than the bus. Also, a bike is more reliable than public transport, less likely to turn up late. Fate is in your own hands. Cycling will help you burn calories. – either you can lose weight or eat more, whichever you prefer. If you feel sleepy in the morning after a tiring commute in the car, try cycling at a gentle pace. You will find that the cycle helps the circulation and gets you prepared for work. If you spend all day in an office its good to have less time seated immobile and more balance in the day. Cycling at a good pace, can release endorphins which help to improve your mood. Cycling is good fun, it’s not all road rage and getting wet. This road is kind of closed to cars. You don’t get so much traffic and you can go down side streets nearby. The bike is the most flexible form of transport, it can squeeze down small alleys and paths inaccessible to cars. It enables you to take a picturesque cycle path to work. You can probably park nearer to the shops / place of work, and you don’t have to worry about avoiding the traffic wardens. The main reason to commute by bike is for personal reasons. But, if you need altruistic reasons, there are quite a few. You will help reduce pollution, congestion, less damage to road, risk of causing death by motor car. All these help. Arrive at work hot and sweaty – Remember it isn’t a race. Take it nice and steady. Even if you cycle at the effort level of walking, you will still get there quick. When it’s hot just wear a spare T-Shirt on the way into work, and carry a spare set of clothes in your car. Or get a bike that is a little faster – like a road bike – you will get there with less effort. To be honest, I don’t really sweat cycling into town. And if all else fails, don’t forget the ‘Italian shower’ technique – a bit of deodorant does wonders. You may get a puncture on the way to work. If you get good puncture proof tyres, you may puncture once a year, if you’re unlucky. You could get tubeless tyres with self-inflation gel and then you are all set. Dangerous. Yes, there is an element of danger, but there is with any method of transport. Cyclists are at more risk, but it has to be kept in perspective and don’t forget the health benefits of cycling. Exhaust fumes. I believe you’re just as vulnerable to exhaust fumes in a motor car, I think it may be even worse. Intimidated to drive in busy streets. Try these tips for defensive cycling to give yourself more confidence. I’m not a cyclist. You don’t have to be a British Cycling 3rd category road racer to commute to town, no more than you have to be a top 10km speed walker to walk into town. 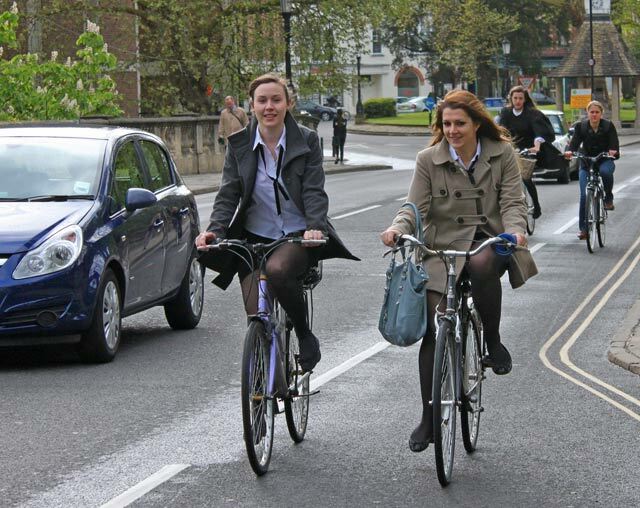 Most people who commute to work by bicycle, would not consider themselves cyclists either. My bike may get stolen. Just buy a really good lock, and cheapish bike. I’ve got a flat tyre – Ring up a mobile bike mechanic or ask a cyclist, they like to show off their bike maintenance skills. Paradoxically, I find this happens most in winter — I can get to work with my scarf frozen to my beard, and yet have the inner layers on my torso and my cap sodden. It’s a fine art trying to wrap up warm enough to get through those first few minutes, yet not over-doing it for when you start needing to shed excess heat, a mile or so down the road, even when taking it at a strolling pace. Yes, it’s always hard to feel a little cold, when you first start off. I sometimes get caught out in spring, when it suddenly warms up, but you’re still in the routine of wearing winter clothes. I agree with all above, and would like to add, cycling is great for stress relief, the everyday type, leaves you more relaxed and content afterwards, its also great for thinking and problem solving, a designer friend of mine reckons his commute contributes to 25% of his income!